New observations with National Science Foundation's Robert C. Byrd Green Bank Telescope (GBT) suggest that what was once believed to be an intergalactic cloud of unknown distance and significance, is actually a previously unrecognized satellite galaxy of the Milky Way orbiting backward around the Galactic center. are being stripped away by its interaction with the Milky Way. Jay Lockman of the National Radio Astronomy Observatory (NRAO) in Green Bank, West Virginia, discovered that this object, known as "Complex H," is crashing through the outermost parts of the Milky Way from an inclined, retrograde orbit. Lockman's findings will be published in the July 1 issue of the Astrophysical Journal, Letters. 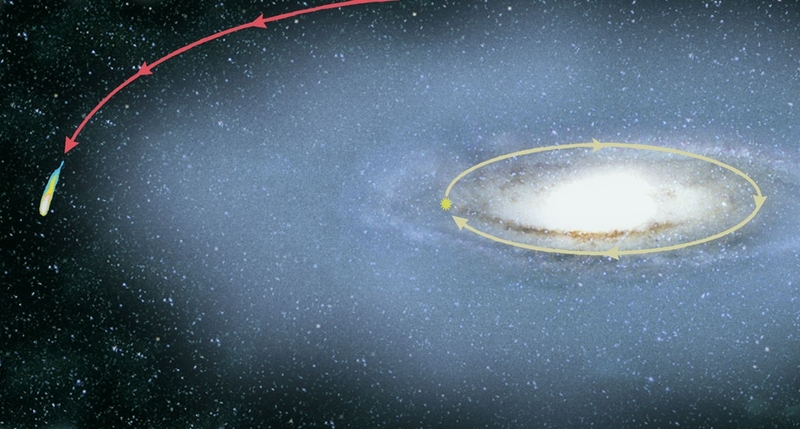 "Many astronomers assumed that Complex H was probably a distant neighbor of the Milky Way with some unusual velocity that defied explanation," said Lockman. "Since its motion appeared completely unrelated to Galactic rotation, astronomers simply lumped it in with other high velocity clouds that had strange and unpredictable trajectories." "The GBT was able to show that this object had a diffuse 'tail' trailing behind, with properties quite different from its main body," said Lockman. "The new data are consistent with a model in which this object is a satellite of the Milky Way in an inclined, retrograde orbit, whose outermost layers are currently being stripped away in its encounter with the Galaxy." "Astronomers have seen evidence that this accreting material can come in from wild orbits," said Butler Burton, an astronomer with the NRAO in Charlottesville, Virginia. "The Magellanic clouds are being torn apart from their interaction with the Milky Way, and there are globular clusters rotating the wrong way. There is evidence that stuff was going every-which-way at the beginning of the Galaxy, and Complex H is probably left over from that chaotic period." The GBT is the world's largest fully steerable radio telescope. It was commissioned in August of 2000, and continues to be outfitted with the sensitive receivers and components that will allow it to make observations at much higher frequencies.